For the first time ever in Wisconsin, prospective home buyers have the option of purchasing a brand-new house with a solar array sized to offset 100% of household electricity use. 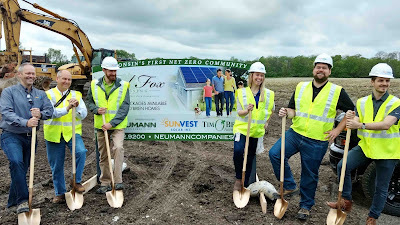 A trio of Wisconsin companies broke ground this week on a residential development in New Berlin that will integrate rooftop solar arrays into all 34 residences built there. Developed by Pewaukee-based Neumann Companies, the home sites at Red Fox Crossing, located on the southwest corner of S. Sunny Slope Road and W. Grange Ave., will be oriented to fully capture the solar energy available. Madison-based Tim O’Brien Homes will design and construct the solar-ready houses, and Pewaukee-based SunVest Solar will design and install each solar system, ranging from six to eight kilowatts. 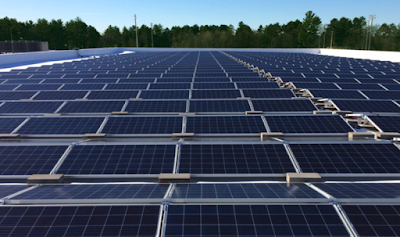 Households that purchase a new house in Red Fox Crossing will finance the solar array through a 30-year mortgage with a 4% interest rate. As the tables below show, the power of long-term financing enables home buyers to reap substantial savings with the first monthly payment. Indeed, the return on investment for these solar arrays will range between 10% and 20% for the duration of the mortgage. 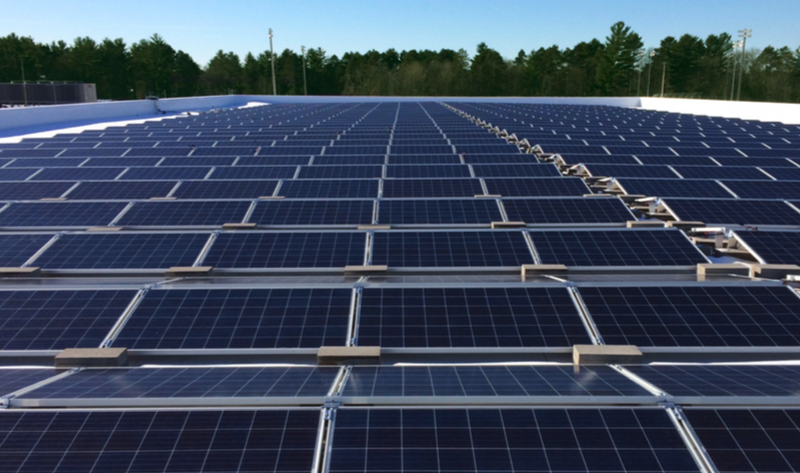 When fully built out, Red Fox Crossing will have between 200 and 260 kilowatts of behind-the-meter solar capacity in operation. 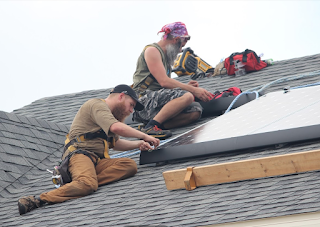 It is on a path to become Wisconsin’s first net zero (electricity) community. Members of the SunVest Solar team at the groundbreaking. According to a WTMJ-TV report, the Neumann team expects individual lots to be ready for permitting and construction sometime this fall, and the first home to be completed and generating electricity by next spring. 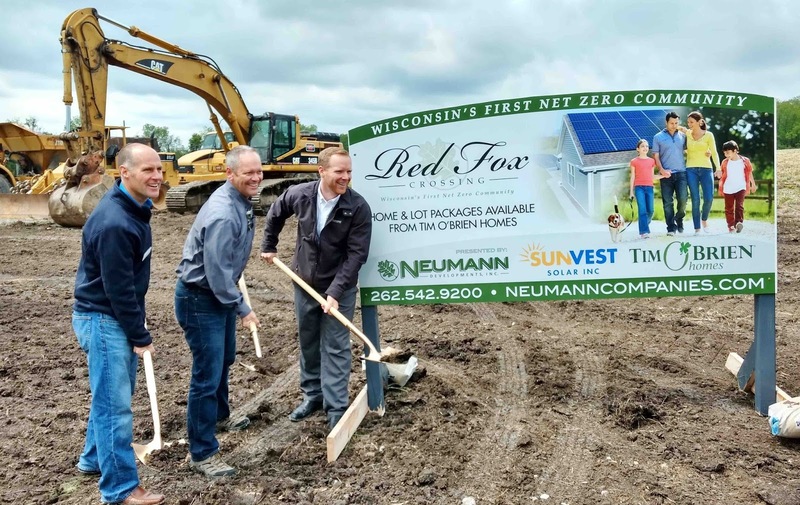 “Red Fox Crossing has the potential to be the turning point in building a more sustainable community and neighborhood in Wisconsin, versus focusing on only one home at a time,” said Tim O’Brien, president of Tim O’Brien Homes. 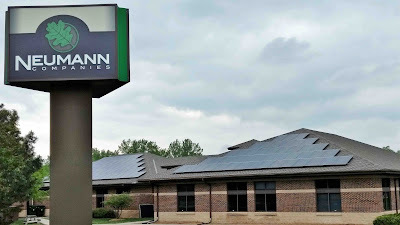 Neumann Companies' new office in Pewaukee, which also features solar panels on the roof. 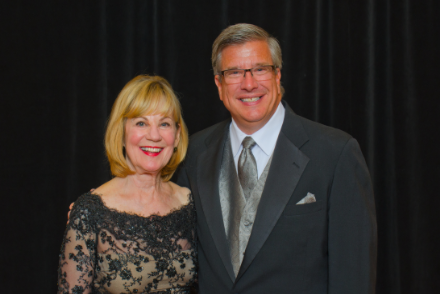 Committee, Sen. Alberta Darling and Rep. John Nygren. Positive steps were taken today on two issues of importance for clean energy and Wisconsin power customers! The State Legislature's Joint Finance Committee met to set the budget of the Public Service Commission for 2017-2019, which includes both Focus on Energy and intervenor compensation funds. Both of the wins described below gained 16-0 bipartisan votes by the Committee, which is made up of 12 Republicans and 4 Democrats. First, the budget for intervenor compensation was partially restored after a 66% cut two years ago. The budget going forward will double to $742,500 annually. These funds enable nonprofit and citizen-based organizations to bring technical and legal expertise to proceedings at the Public Service Commission. RENEW Wisconsin has historically used this fund to support our advocacy in utility rate cases, power plant proposals, and numerous other proceedings at the PSC that impact renewable energy. In addition, the Citizens Utility Board frequently uses this fund to bring expertise to cases in order to keep utility rates as low as possible for residential and small business customers across Wisconsin. Governor Walker had proposed this restoration of funds in his budget, and the Committee adopted it. This is great news, and we applaud Governor Walker and members of the Joint Finance Committee for adopting this provision. Secondly, Focus on Energy's budget will remain unchanged, allowing for the most cost-effective energy efficiency and renewables projects to be funded. 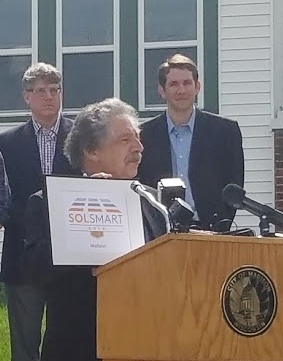 The Governor has proposed to eliminate the ability for school districts to borrow above their revenue limit to fund energy efficiency and renewable energy improvements (commonly called "Act 32" projects). To backfill that change, the Governor proposed allocating an additional $10 million from Focus on Energy's budget for schools above what they spent last year, which would have earmarked nearly $15 million out of the total $93 million for schools alone. revenue exemption. See the full case study from SunPeak. Concerns had been raised that schools would not be able to use that much Focus on Energy funding. The proposed earmark could have siphoned funding away from private business installations in energy efficiency upgrades, leading to unspent dollars in the Focus on Energy program and a less cost-effective set of investments. The Committee voted 16-0 against the Governor's proposal, leaving the Focus on Energy budgets unchanged. This is very good news since the program returns over $3.50 for every dollar invested, and schools will still have ready access to incentives through existing programs. This sets up an important vote later in the Joint Finance Committee schedule regarding the Governor's proposal to repeal the Act 32 school district revenue exemption. 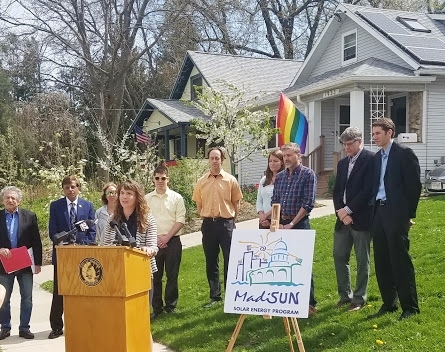 RENEW Wisconsin was supportive of both of these successful measures through our participation in the Customers First Coalition. The biennial budget needs the approval of both the Assembly and the Senate before being signed by the Governor. Typically, the budget process lasts through June. For more information on these topics and the state budget, please see RENEW's Clean Energy Summary of Governor Walker's Budget, and our recap of the 2015-17 state budget. Finally, please support our work: become a member of RENEW Wisconsin today!